It was your stereotypical University of Minnesota Duluth Bemidji State men’s hockey game, deadlocked at one apiece after two periods of play. The Beavers decided to shed that stereotype tonight when they scored three goals in 3:35 in the third period of tonight’s 5-2 loss. Senior winger Blake Young’s first period goal 7:27 into the contest gave the Bulldogs their one and only lead of the night which lasted until midway through second period. Senior center Gerry Fitzgerald rocketed a slap shot home high glove side past sophomore goaltender Hunter Shepard just six seconds into Bemidji’s second power play. Heading into the final intermission all even at one apiece, the Bulldogs found themselves unsuccessful in trying to weather the third period Beaver barrage. UMD’s penalty kill struggled again tonight as Bemidji went 2-for-5 on the man advantage. The Bulldogs are now 7-for-12 a man down in their last two games bringing their season total to 12-of-18. UMD went 0-for-3 on its power play opportunities tonight. Total shots tonight were heavily in favor of the Bulldogs as they outshot the Beavers 29-17. UMD was up against one of the best in the country facing 2016-17 first team All-American and Mike Richter award nominee Michael Bitzer. 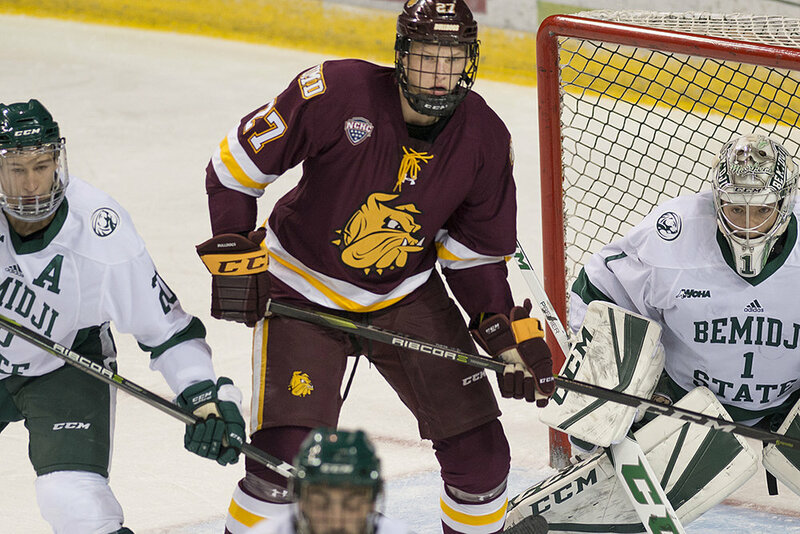 Bitzer’s numbers in his last five bouts with UMD are nothing short of exceptional posting a 1.18 goals against average and a .959 save percentage going 3-1-1. UMD is back at it again tomorrow night to wrap up the series at home against the Beavers with a 7:07 puck drop.